It’s a hexagonal piece of lead, maybe the size of a fingertip. Canister shot, it was called, and the Continental Army used it to shred British lines at the Battle of Monmouth in June of 1778. 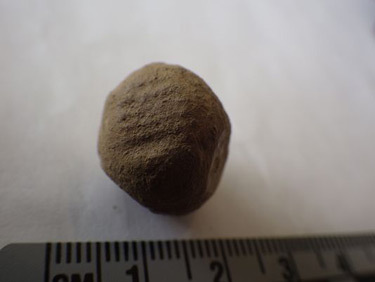 When his team of volunteer archaeologists found this and other pieces of ordnance in the ground at Monmouth Battlefield State Park last summer, Dan Sivilich suspected they were not your typical artifacts. “Two appeared to have fabric impressions on them which suggested they might have hit a uniform,” Sivilich said. He sent them to PaleoResarch Inc. in Colorado for testing. Nine months later his hunch was proven correct — and then some. One of the pieces tested positive for human blood protein. That’s not all. Based on where they were discovered, Sivilich believes the pieces probably were fired by Proctor’s Pennsylvania artillery. One of its cannon is associated with the legendary heroine Molly Pitcher, whose real name likely was Mary Hays. the Archives of Never Yet Melted in the 'Battle of Monmouth' Category.